Quarzputz®, Sandblast®, Freestyle®, Sandpebble®, and Sandpebble® Fine finishes are premixed 100% acrylic-based coatings which are offered in standard colors as well as custom colors. 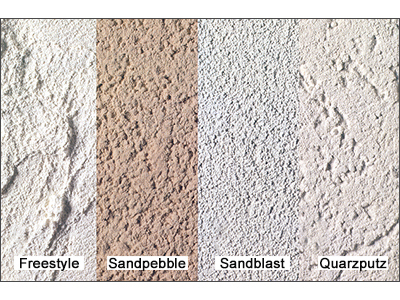 They provide the finishing touch that adds lasting color and texture to exterior and interior walls. These are the original five finish textures with DPR (dirt pick-up resistant) chemistry that will remain clean longer after application. DPR finishes are durable architectural finishes providing surface color and texture for Dryvit systems. These finishes can also be applied over properly prepared substrates such as exterior masonry, stucco, precast or cast-in-place concrete and other approved substrates. The finishes are also suitable for interior applications. All finishes can be trowel applied or spray applied with a hopper gun or pole gun-type sprayer.